Stay calm, and don't look a black bear in the eye, experts say. In a split second, I spotted them: A pair of round-tipped black ears peeking above a scraggly bush alongside the single-track trail, about 10 yards ahead. The surge of adrenaline was instantaneous, and my reflexes kicked into autopilot as I slammed my fingers around my bike's brakes. "Oh my god, that's a bear!" My companion skidded to a halt behind me. Before we could react further, the smallish bear — it appeared to be a juvenile, and it surely heard and saw us first — scampered off into the thick brush away from us. "What do we do? We have to go back that way to get back to the campsite," I mused aloud, adding that our encounter could be part of a family unit, with a protective mother bear waiting just out of sight. In the end, we made it back to camp safely and without further incident. It turns out we reacted to seeing the bear in probably the most ideal way, according to many wildlife experts; by making a lot of noise. And as fate would have it, the black bear encounter happened the first day of our trip, prompting everyone in our group to take appropriately careful measures to keep our campsite clean and free of temptation in the form of easily accessible garbage and food. No one wanted to meet that little bear again. "The thing with black bears is, they're omnivores — they eat everything and anything they can smell," says Madonna Luers, spokeswoman for the Washington Department of Fish and Wildlife's Eastern Region, which encompasses the state's 10 easternmost counties, including Spokane, Stevens, Whitman, Ferry and Pend Oreille. Black bears are the most common bear species inhabiting the Inland Northwest, with an estimated population of 25,000 across all of Washington state, Luers says. "They have incredible noses, and so they are sniffing out that campsite grilling you're doing, and even a tuna fish sandwich in your picnic basket. They are sensing that and trying to come in for an easy meal," she continues. "When you hike and camp in bear country, nine times out of 10, that is the No. 1 thing to be alert and aware about. Be careful about how you pack and store food in the backcountry." 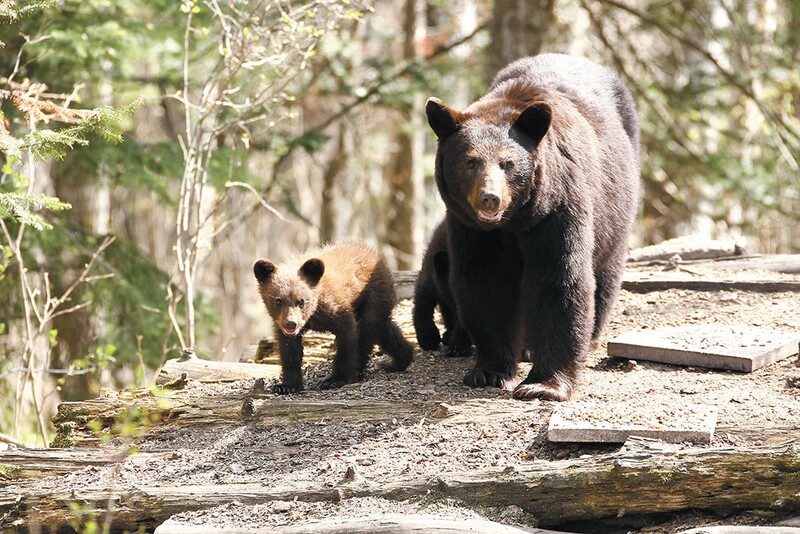 Luers cautions that while black bears are the species most common to the area, a small population of grizzlies are known to roam remote areas of Eastern Washington and beyond. Because of that, the chances of encountering a grizzly in this region are significantly lower than meeting its black bear cousin. Even so, a grizzly encounter shouldn't be overlooked, because the species is more likely to be aggressive than to flee, as black bears tend to do. And while it's quite rare that a black bear feels threatened enough to attack a hiker or camper, it does happen. Earlier this month in Alaska, a teenage boy participating in a popular annual mountain race was chased and killed by a black bear; the next day, a worker at a remote gold exploration site was killed, and another worker injured, in a black bear mauling. In Washington state, records going back to the year 1900 show only 17 reported close encounters with black bears. Seven of those events involved hikers with off-leash dogs that startled the animal, and six incidents involved hunters, Luers says. None of the encounters were fatal. The most recent, in 2010, did require medical care for the victim, who was injured by a human-habituated black bear while walking his dog outside of Wenatchee. In the majority of encounters between humans and black bears, Luers again emphasizes that the animals are looking for an easy meal. The species spends the warm season from spring through early fall with one motive: Eat and fatten up before hibernation. Unless bears are habituated to being around human-populated areas, most of the time they're going to be just as scared of us as we are of them, she notes. To be on the safe side — beyond making informed decisions about keeping food and garbage secure — bringing bear spray on a hike or camping trip is never an overly cautionary plan. Make sure you know how to effectively use it before you head out. "People should always carry bear spray," says Fish and Wildlife biologist Annemarie Prince, who often interacts with the public for educational and outreach events. Prince notes that beyond food and trash, greasy camp stoves or cast-iron pans left out at a site can often be overlooked. Unopened food is also not bear-proof, she adds. In most cases, locking such items in your car at night, or if you leave the campsite, is enough to keep black bears at bay. However, Luers says black bears have been known to try and break into cars if they can smell food inside. Stringing a rope between two trees, and suspending any food or garbage from it at least 10 feet above the ground, and at least four feet from any nearby trees or branches, is another method to secure food or trash if storing it in a vehicle is not an option. While these precautions can help keep a black bear from tearing apart your campsite looking for snacks, they still might come by to scope things out. In any encounter, Luers says to stay calm. Don't make loud shrieking noises that might make a bear feel threatened, and don't look a bear in the eye. New research has shown that some bears may interpret direct eye contact as a challenge, and charge. If you can, she says, try to stay upwind of the animal so that it can smell you, and realize you're not food. And while it may sound obvious to most, don't ever approach a bear — or any wild animal, large or small, for that matter. For more information on recreating in bear territory, visit wdfw.wa.gov/living/dangerous/.